In keeping with the Group’s mission to “apply an integrated, holistic approach to manuscripts and texts in other forms”, our Session gathered papers closely examining the materials in the margins of manuscripts, especially those that not only comment upon the texts which they surround, but which may offer alternative or even “corrective” readings to a manuscript’s central text. That is, while some marginal images exist to support a text (by providing mnemonic aid, or by illustrating a scene in a “central” story), others seem to exist at a disjoint to their neighboring text (as with the rude grylles and shitten monkeys that pepper so many holy works) and so may offer counterpoint or even contradiction to an otherwise uncontested central text. Our papers considered such potentially “self-correcting” marginalia in medieval manuscripts: the images that, while often subordinate to the text, still find a rebelliously self-reflexive voice. 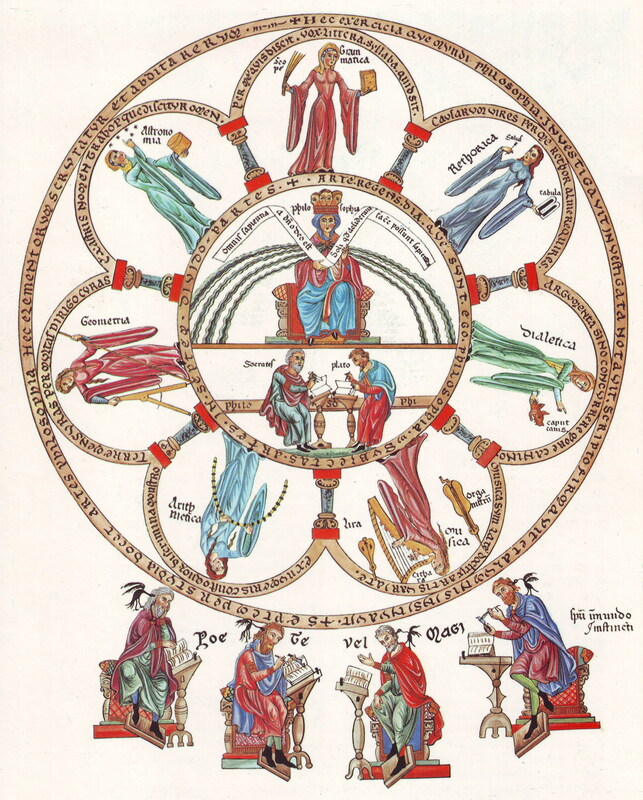 Philosophy and the Seven Liberal Arts, as depicted in the “Hortus Deliciarum”. Via Wikipedia Commons, License, License CC-BY-SA 3.0. The omission of one sponsor’s name in the Congress Program is corrected both in the Congress Corrigenda and here. The Abstracts of the papers are published on the MEARCSTAPA website, for which we cite the links. Abstracts for these papers appear on the MEARCSTAPA website; and now Kzoo Abstracts. The full 2009 Congress program is archived as Printed Program of the 44th International Congress on Medieval Studies, including the Corrigenda. The Societas Magica sessions are listed as Sessions Sponsored by the Societas Magica at the Forty-Fourth International Congress on Medieval Studies May 7–10, 2009. The MEARCSTAPA website cites its activities at this Congress, but does not mention us. We remember our participation in and co-sponsorship for them. Also, we recall that the organization itself arose out of the session which the Research Group sponsored in the 2008 Congress. 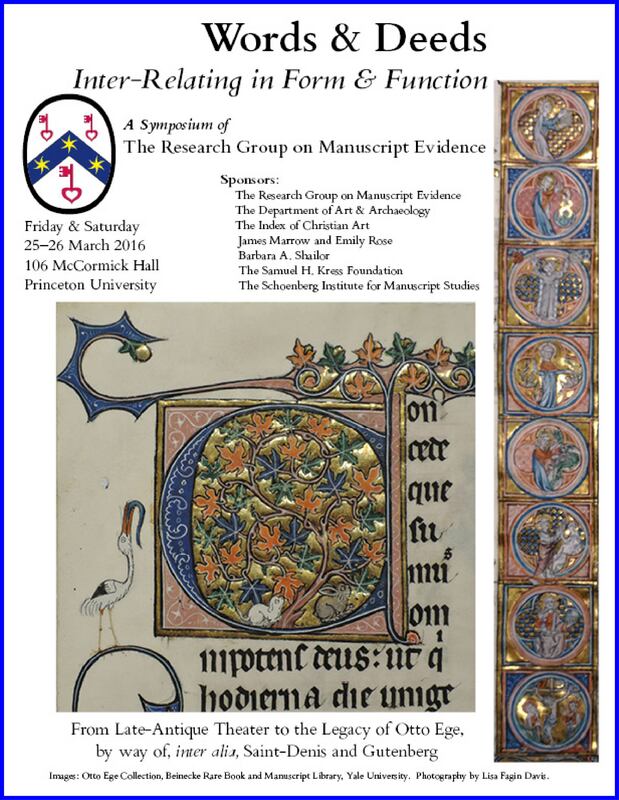 That the historical and documentary record for actual events, medieval and other, might be partial, limited, and variable is a subject explored in some of our blogposts on Manuscript Studies and the reports of our early Seminars on “The Evidence of Manuscripts”. The full list of Research Group Activities at the Congress appears in our Congress Archive.